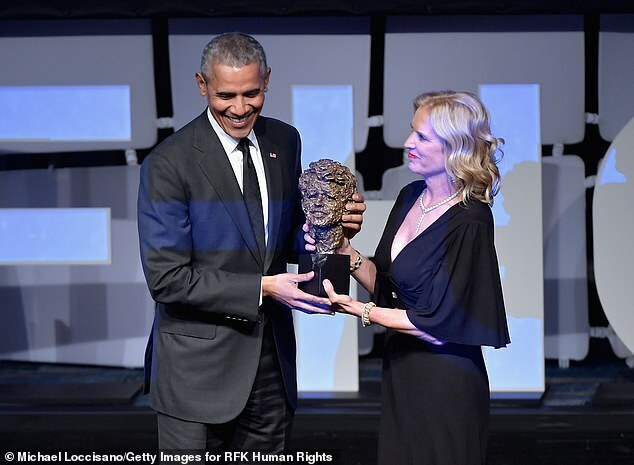 Barack Obama was all smiles as he was honored with the Robert F. Kennedy Human Rights Ripple of Hope Award in New York on Wednesday evening. 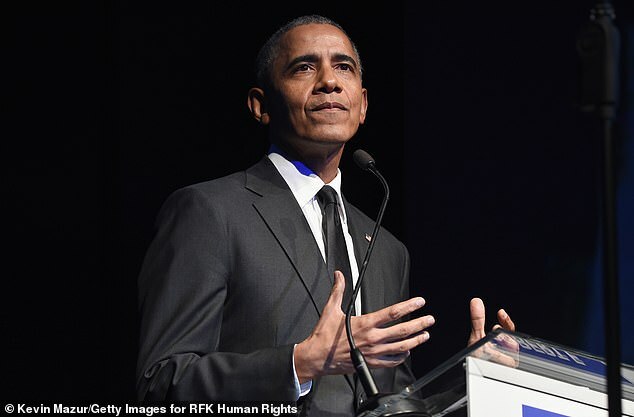 The former president, 57, was honored with the special award that celebrates leaders who demonstrate ‘commitment to social change’. Past recipients of the award include Bill Clinton, Hillary Clinton, Al Gore, Bono, George Clooney and Robert De Niro. 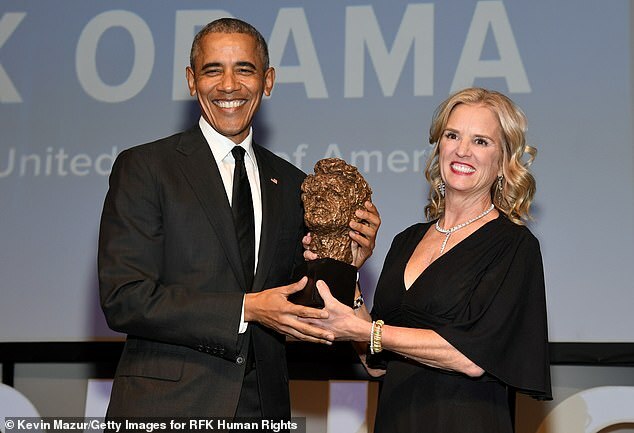 The former president grinned ear to ear as he accepted the award, a bronze bust of Bobby Kennedy’s likeness, by the organization’s president Kerry Kennedy. In his acceptance remarks Obama urged the audience to be hopeful towards the future. ‘Hope is the insistence that no matter how tough our circumstances, there are better days ahead. If we persist…together we can overcome,’ he said. ‘The story of the last 50 years is the story of a more just and peaceful world. I have seen it. I have lived it. You have too,’ he added. 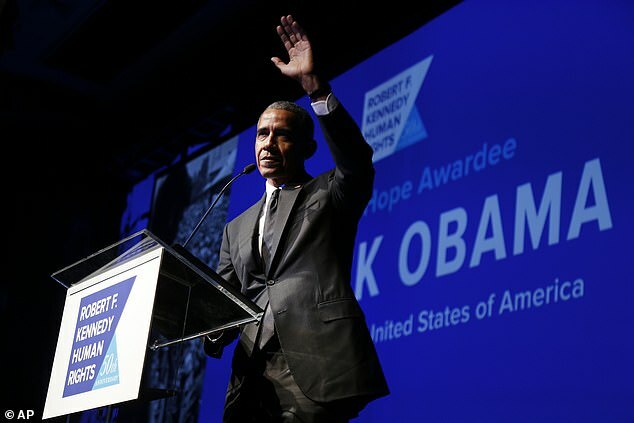 ‘I’m not sure if you heard, but I’ve been on this hope kick for quite awhile,’ he joked, citing the central theme of hope in his previous campaign trail speeches. The president also took to Twitter to reiterate his speech, reminding the public on the achievements of Bobby Kennedy, who the award is modeled after. ‘As Bobby Kennedy taught us, the thing about hope is that it travels through space *and* time, first splashing against the rocks, but eventually breaking down the walls of cruelty and injustice. And if we do our best with the time we’re given, others will take hope in our example,’ Obama wrote. Also being honored were New Jersey Gov. Phil Murphy, Discovery President and CEO David Zaslav and Humana CEO Bruce Broussard. 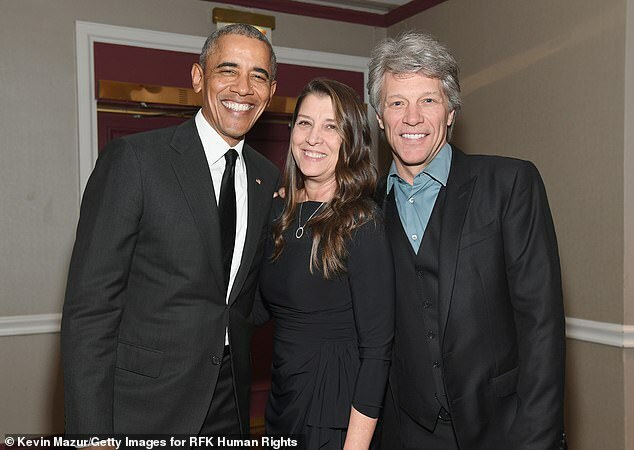 Also in attendance were Jon Bon Jovi, Alec and Hilaria Baldwin, actress Cheryl Hines and actor Keegan-Michael Key. Coinbase allowed to trade securities; What does this mean for crypto?